Recently I’ve been visiting several medical institutions (some big hospitals and smaller clinics) for various purpose. One thing in common about these medical institutions is that the waiting period before you get to see a doctor can vary from 30 minutes to 2 hours. Because of the long waiting period, I usually bring along a newspaper and my smartphone to keep myself occupied while waiting for our turn. Sometimes I wish that these medical institutions can be a bit more efficient by allowing patients like us to check for a doctor’s availability online and allowing for bookings to be made to meet up at a specific time. Nearly all the medical institutions that I’ve been to are attending to patients based on a first come first serve basis. While this is a good concept for new and walk in patients, existing clients may get turned off when walking into a medical institution full of patients and worst of all, no empty seats left to sit and wait. Some patients would make a call to the clinic or hospital to check if there’s a large crowd before heading over. Sometimes the officer attending to customer queries on the phone don’t even know how many patients they currently have and can’t really anticipate how many more patients are coming in for the day. I’m sure medical officers who are busy answering phone calls wished that there’s a way for patients to check for themselves if a doctor is available at a certain time rather than calling in. Most medical institutions would leverage on software such as Hospital Information System or Clinic Management Systems to help them manage everything from patient details to medical records. 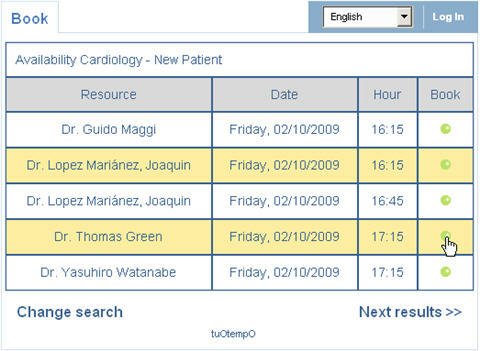 If your medical center needs the ability to provide online appointment booking service to existing and potential customers, then this web based SaaS patient relationship management (PRM) software called tuOtempO WEB is ready for you to implement today. 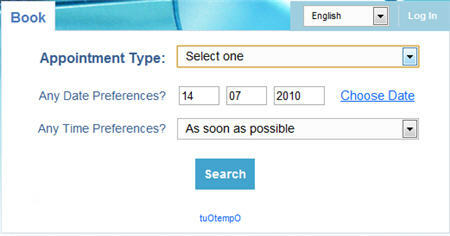 tuOtempO WEB is an online appointment booking service which you can easily integrate into your existing web site. Visitors to your website can simply click on the Online Booking link to begin scheduling an appointment. Doctors who are available on a specific date and time will be listed out accordingly for the client to book. Once successfully booked, the client will be sent an email / sms confirmation. 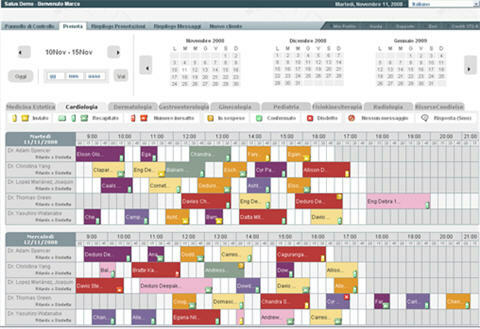 To integrate with an existing internal agenda system, the tuOtempO SINCRO can be used to securely synchronize the web based online booking against your internal agenda. But if your medical institution doesn’t already have an internal agenda, you can use the tuOtempO AGENDA to simply manage all appointments and availability. For more info on how the web based SaaS online service can help your medical institution improve its patient management capability, check out tuOtempO today!